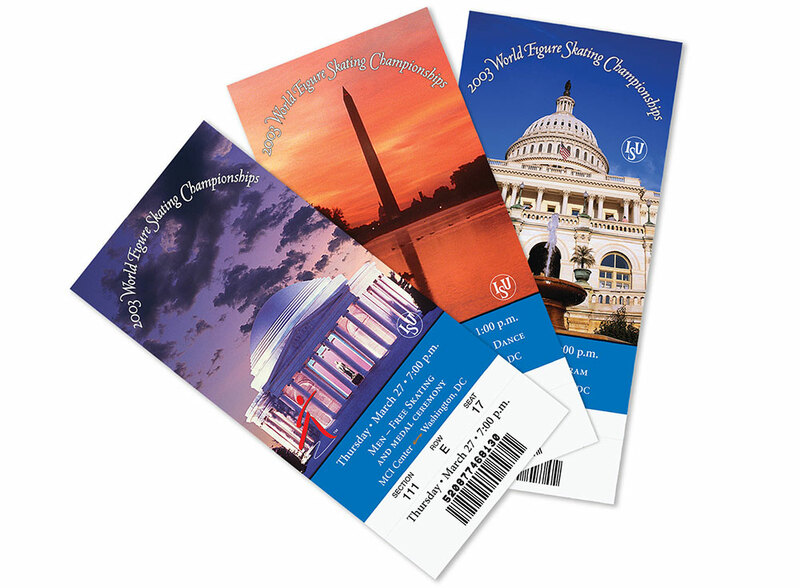 We began developing the identity for the World Figure Skating Championships with the logo commission in Washington, DC’s bid to become the host city of the 2003 Championships. Once Washington was selected as the official site for the event, the logo was sanctioned by the International Skating Union as the official logo and we were off and running. Over the two and a half years leading up to the event, we developed a wide variety of materials—promotional brochures, posters, signage, banners, advertising, souvenir items, competition manuals, even the tickets. The logo and our other work for the Worlds were enthusiastically embraced by skaters and fans alike. Tickets sales and souvenir items sold briskly. Profits from the event were used to establish the Capitol Skating Fund, which benefits skaters in Maryland, Virginia, and Washington, DC.